Masoor Dal was the first dal my partner taught me to make, and I’ve made it almost every week since. If it’s rajma, it must be Sunday … if it’s Masoor Dal, it must be Tuesday or Thursday. Part of the reason we eat this naturally vegan dish so much is because we love it. It’s classic comfort food, and very soothing if you’re sick. But it’s also fast! 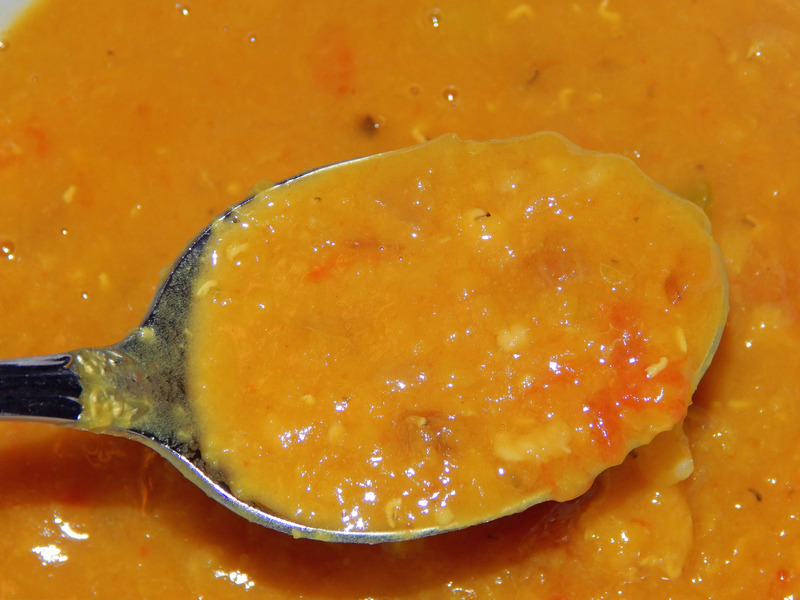 Red lentils require no soaking and cook in 20 minutes – even in a regular saucepan! 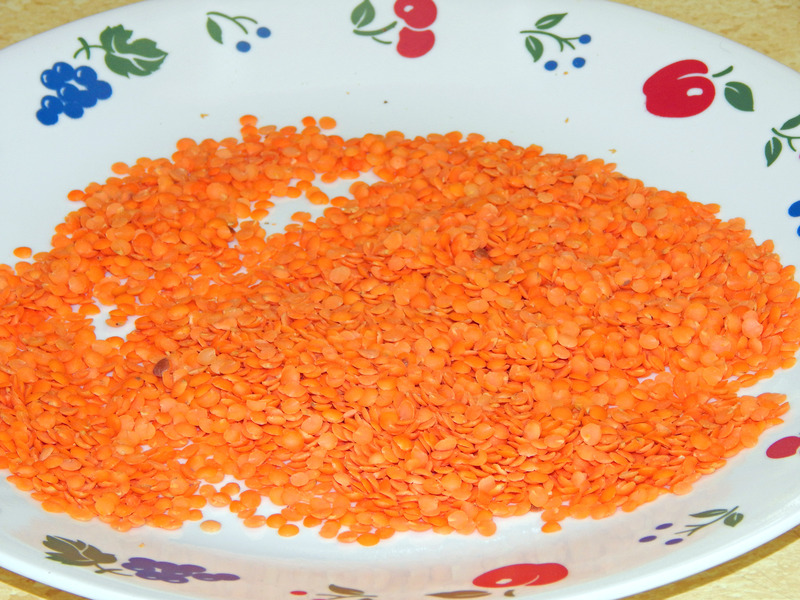 Pour a cupful of red lentils on a plate and sort and pick through them. Hopefully you won’t find any bugs, but you may find a bit of some other sort of plant or a small stone. Then put the lentils in a small bowl and rinse with cold water. Do this several times until the water is no longer cloudy. WARNING: The lentils will change from red to yellow as they cook. This is normal. Do not panic. Heat the vegetable oil over medium-high heat in a large skillet. Add the onions and peppers. Cook, stirring only occasionally, until the onions begin to turn translucent. Add garlic and ginger and cook 3-4 more minutes. Add tomatoes and cook another 5 minutes or so until soft. Pour the onion mixture into the lentils and stir. Add garam masala if using. Serve over jeera rice. Mango pickles go very well with this! You can also make this in a pressure cooker – one to two whistles. I actually prefer making this in a pot, though, since I can see exactly how done the lentils are getting. I usually love foods to be extra spicy-hot, but for some reason I prefer this a bit on the milder side. So I cap the green chilis at three and don’t use any red chili powder. American brands of garam masala (McCormick, etc.) tend to be milder than garam masala bought from an Indian grocery. So for American garam masala use the 1/2 teaspoon; for Indian garam masala try 1/4 teaspoon. I always use fresh garlic, but I’m not adverse to using a spoonful of ginger paste instead of fresh ginger. Since we always eat this over jeera rice (basmati rice cooked with cumin seeds), I don’t add any cumin to the masoor dal. If you eat this over plain rice, try adding about 1/2 teaspoon ground cumin to the lentils while they are cooking, or fry a teaspoon of cumin seeds in the oil for a few seconds before adding your onion. Indian cooking is highly individual and customizable, so there are many ways to make this. For example, some Indian cooks may choose not to use garlic, or use red chili powder instead of green chili peppers. Some Indian cooks might add a pinch of hing. Some may garnish with methi or cilantro. Sometimes I don’t use garam masala because that’s just the mood I’m in that day. HOWEVER, it seems my American friends (and American recipe books, and American recipe web sites) can have very strange ideas about masoor dal! 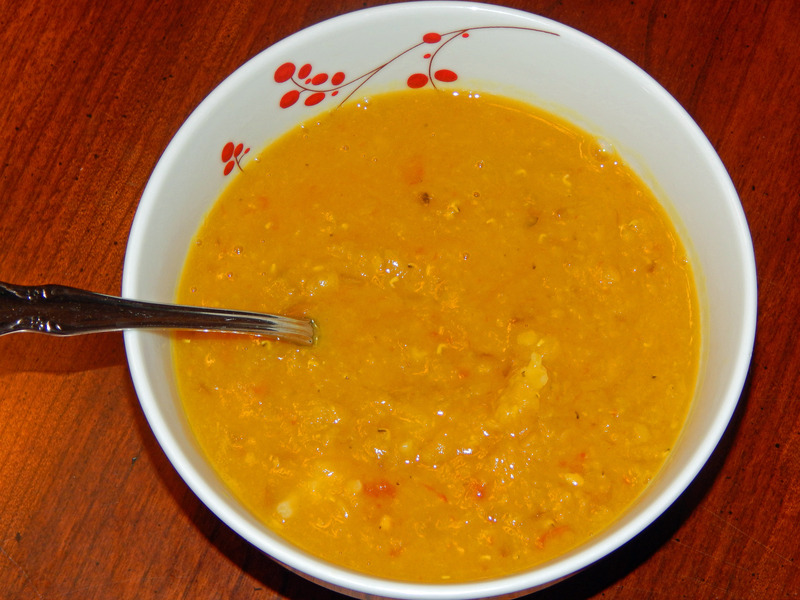 (Just check out the pictures and comments for AllRecipe’s Red Lentil Curry.) So here is some general advice and a few things NOT to do. Red lentils do NOT require pre-soaking! Masoor Dal is supposed to be a bit mushy, soupy, and creamy. It’s not supposed to be a dry mass of fully formed lentils without any liquid. Nor is this supposed to be chewy and under no circumstance should this be crunchy! 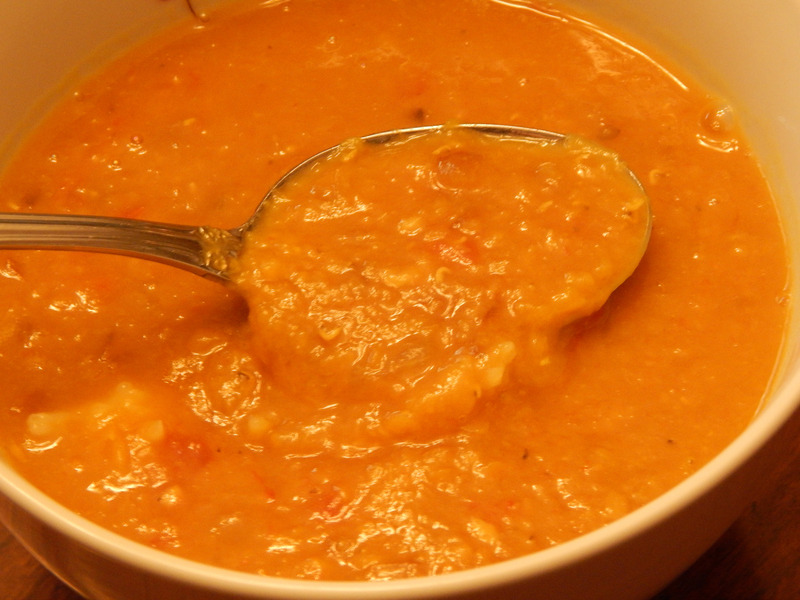 DO use split red lentils for this recipe. DON’T make this with brown lentils or French green lentils and expect the same result. DON’T use vegetable broth instead of water. This is the biggest mistake I see. Friends and students complain their Indian cooking doesn’t taste like mine and when I question them, I find they’ve been pouring vegetable broth in everything. Not only do you not need it for flavor, but many times the flavors in the broth (celery, for instance) are not compatible with Indian cooking. DON’T use curry powder or curry paste in this recipe. Most especially, DO NOT use green curry paste. That’s Thai cooking, not Indian cooking. Yum. I’d make this for lunch right now, but I’m out of red lentils! It would be a sad day in this house if I ever ran out of red lentils!!! Bought more last night, so our kitchen is back in the clear! Did you enjoy it? Super-easy and I can see a pinch of hing would work well! We both loved it and the hing worked nicely, I think. Had dinner and lots for lunch the next day too! That looks yummy! I have lentils in my house all the time but have never tried the red ones. May have to pick up some just so that I can try your recipe. I finally made this this AM to take to work for lunch. Really yummy. I’ll definitely be making this again. (Yes, sometimes it takes months for me to make a recipe). I made my own Garam Masala to add to it (found a recipe / instructions online). And thanks to you, I tried Mango Pickles for the first time ever. Ha, I understand! It takes months sometimes for me to make a recipe, too! Would love your Garam Masala recipe! And how did you like the mango pickles? They’re a bit salty but quite addictive! If you liked the taste, you can also take any kind of bread and rub/mash a pickle over it. Surprisingly tasty.